A money saving mop combo. Save yourself some cash when you buy these popular products together. This is the ultimate set. Get the best bang for your buck, and add another powerful tool to make cleaning easy when you buy this Super Deluxe Combo. This set includes everything you get in the deluxe set, but you also get the head and pad for the Smart Bathroom Mop. It works with the same pole as the larger, 18" mop, so you can swap the heads to suit your current job. You will only get one mop pole with this combo. 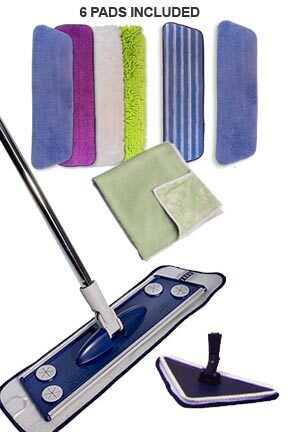 Get one full 18" Smart 3-in-1 Microfiber Mop and two multi purpose pads, the bathroom mop head and pad, a 4-pack of additional 18" pads and a multipurpose miracle cloth. Be fully prepared for non-toxic cleaning in any room of your house. Built in cloth holders Yes - use a regular pad, or attach any kind of cloth using the circular holders. 3-in-1, 18" Microfiber Mop by Smart - Fast and easy mopping! Choose a chemical-free and environmentally friendly way to clean your floors. Our microfiber mop works great on virtually any hard surface, & is perfect for hardwood, tile, marble, linoleum & more. An improvement on the older Swift microfiber mop, this Smart version makes cleaning even easier. Pad Dimensions (l x w) 11.5" x 6.5"
Head Dimensions 11" x 6"
Bathroom Microfiber Mop by Smart - An all in one tool for cleaning your entire bathroom. It is an excellent mop for cleaning tight corners and hard to reach spots, but also works great for scrubbing tile and grout and so much more. Use it hand held or on the pole for maximum versatility. I need you to recommend a mop that can be used to clean my hardwood floors? Any of our flat, microfiber mops would be a good choice for wood. I have been on this waiting list for about 6 months or more. I just submitted to be on it again. Has it been dis continued? Can you tell me if you will ever have this again or not and when?